At first look, The Parallax View appears to have been hastily assembled. This impression is supported by the comparative irrelevance of the actual storyline, the appearance of several name actors in short parts obviously shot on day-contracts, and an acute lack of balance in the montage. Many scenes are too long, some apparently crucial encounters are left out altogether, and many more sequences seem to have been included merely to provide gratuitous action: a tavern brawl, a car crashing into a supermarket, and the whole bomb-on-the-plane sequence do very little to further the plot. Yet the impression of the film as slapdash is negated by the tautness of several performances (including Paula Prentiss, of all people, doing the closest thing to acting I’ve yet seen from her, and Walter McGinn, whose studied duplicity as a Parallax Corporation recruiter provides some of the most insidious moments of the film); and by the obvious care with which each shot has been set up, framed, and photographed. The Parallax View is one of the most audaciously visual films to come out in quite some time, and Gordon Willis’s superbly controlled Panavision Technicolor photography soon makes the viewer aware that what really happens in this film happens not in the “story,” not in the montage, but in each individual shot. 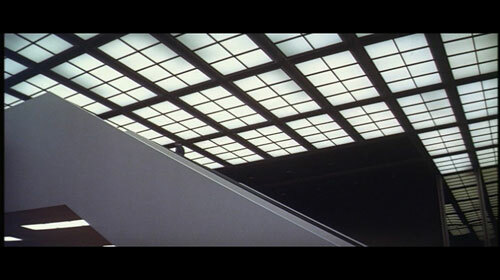 As the title of the film implies, and as the mise-en-scène soon confirms, geometry is essential in The Parallax View. The Parallax Corporation is associated with spacious, antiseptic, dehumanized environments, marked especially by parallel and perpendicular axes, crisscross pigeonhole patterns of building windows, girders, beams, corridors, and the oppressive angles of a huge dam. As Frady penetrates the inner workings of the Parallax Corporation, this architecture becomes more and more prevalent, and is filmed in longshot so that it draws our attention away from Frady, and variously competes or conspires with the borders of the frame itself to suppress and limit his movements. When the film moves into the spacious arena where the final scenes are played, Frady rides an escalator that cuts the frame diagonally from lower right to upper left. Behind and above, the crisscrossing of the huge support beams and the acoustical ceiling strain down against his tiny figure. In the lower left portion of the frame a wide, blank area of floorspace opens out toward us, inaccessible to Frady because of the wall of the escalator, placing him in a plastic Limbo, between an architectural devil and deep blue sea. Inside the arena, a political rally is being rehearsed, and even human beings are arranged to conform to rigid geometrical- patterns dominated by right angles: a parallelogram of school students is trained to hold up placards on cue to form pictures. The consistency and integrity of the film’s imagery make us aware that the film will end here, as we recall a parade of uniformed schoolgirls in the film’s opening sequence, marching in crisscross patterns and providing the first indication of the film’s concern with the geometricization of the human. Frady’s setup by Parallax to be the fall guy in a new assassination is emphasized in his final struggle to escape the building and the camera frame—as well as the circumstantial evidence of his guilt—by hiding in, then running through, a jungle of beams, girders, and catwalks. Severe angularities take over the frame entirely as he attempts to elude the Parallax executioners. When he at last runs down a corridor toward the sunlight shining in through an open door, the texture of the film image coarsens to a wide grain, trapping him forever in a moment of distorted history: his death will ensure the presumption of his guilt and the continued anonymity of the Parallax Corporation. Pakula and Willis get a lot out of the use of a stationary camera in the best sequences of The Parallax View. By holding a longshot for an unusually long duration, Pakula forces his viewer to take stock of the validity of his own perception of what is really going on. And we almost always discover, to our surprise, that one apparently important thing happening in one part of the frame is drawing our eyes away from a more important thing elsewhere on the screen. Machines abound in the film—elevators, escalators, an airplane, a boat, cars, jeeps, trucks, a grid cart, and the Woodland Park kiddie train—and they consistently distract our attention from the human. Toward the end of the film, when an ambulance crew wheels a stretcher right-to-left across the arena toward the body of an assassination victim, a police car appears in the back of the building and speeds toward screen left. Every swerve of the car is matched by a turn of the stretcher among the tables and chairs grouped on the floor, and both pull to a halt simultaneously, to a great squeal of brakes. In the same way, early in the film, the huge dam at Salmontail—a combination of machine with sterile, angular architecture—so fascinates us as it slowly opens and pours tons of water into a shallow river that we can scarcely look away to observe the life-and-death struggle between villain and protagonist occurring in another part of the frame. Pakula and Willis have conspired in one of the most exciting uses of widescreen I have seen, treating the spacious individual frame in the same way that Breughel or Goya treated a painting: as a world-in-itself, in which the observer must wander alone, to read the signs carefully or be hopelessly overwhelmed. The Parallax View boasts an interesting series of variations on a suspense-shock technique. I envision Pakula asking himself, Just how many times can you get away with protracting a sequence to the point of either unbearable tension or near-loss-of-interest, then climax it with a shock (an explosion, a shot, a death, a telephone ring, a glimpse of a familiar face)? If this is the experiment he set for himself, he has succeeded; for each time he uses the technique he does so in a different way, managing to shock us often enough when we don’t expect it because equally often he doesn’t shock us when we do expect it. Nevertheless, the experiment is not wholly successful; because as fair as the shocks are, they represent an objective kind of shock. They don’t involve us. We admit our surprise and respect the technique that evoked it, but we don’t gasp, we don’t jump in our seats. Perhaps the film’s architectonics are too severe, alienating us from emotional involvement as surely as they isolate and dehumanize—or destroy—the film’s characters. The Parallax View has been described by some critics as a paranoia film. I don’t quite see it. Despite his inventive use of frame-space, and his concern for sustaining his geometrical imagery of threat, Pakula seems to have overlooked the all-important role of physical space in creating an emotional (as opposed to purely visual) atmosphere of paranoia. All the inverted triangles and restricting perpendicular axis in the world are not going to convince us that a man is trapped if he happens to be in an enormous building that offers far more hiding places and exits than the people chasing him could possibly investigate. Frady may well be unable to escape from such a building—but the dimensions of the structure itself negate the audience’s capacity to feel the threat of the trap closing on him. The only genuinely paranoiac scenes the film creates are those few that occur in cramped quarters, the best being the two interviews between Frady and his recruiter, set in Frady’s dingy one-room apartment with God-knows-what waiting just outside the door. Pakula has generally sacrificed this more conventional kind of effectiveness for the sake of experimentation; and the result, though visually thrilling, is rarely emotionally affecting. The Parallax View doesn’t work as a sortie into paranoia, because it is virtually impossible to identify with Frady, and without such identification there can be no personal transference of danger and fear from the screen protagonist to the viewer’s mind. 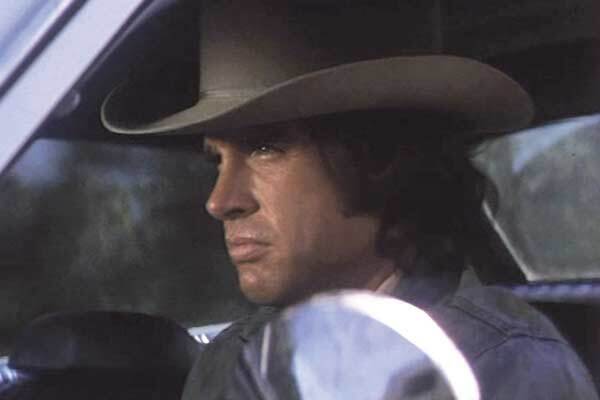 Frady is defined from the very beginning as a contrarian, not so much a maverick as an antisocial renegade, who commands far less of our sympathies than previous Pakula misfits like Pookie Adams (The Sterile Cuckoo) or Bree Daniels (Klute). His interest in the conspiracy theory arises not from a sense of right or justice, nor even from healthy curiosity, but from a desire for the material gain he can get from a big story. This may be a realistic description of journalistic motivations, but the audience is alienated. They don’t want to identify with that. In addition, any possibility of the viewer’s sharing Frady’s paranoia late in the film is quashed because the paranoia is not properly built early on. We see him successfully avoid at least three physical attacks on his life, diminishing by degrees any fear we could feel for him, or with him, under future threats. The early sequences of the film make Frady more of a resourceful James Bond superhero than a threatened Hitchcock subhero with whom we might easily empathize. Parallax – Any apparent displacement of an object due to an observer’s position. All of the visual experimentation in The Parallax View serves Pakula’s metaphorical purpose in describing the elusive nature of conspiratorial activity. By composing his shots as he has, and by using an almost totally unrelated soundtrack, he emphasizes that what we conclude to be true is inevitably based upon our distracted observation of a given action, or the apparent displacement or alteration of that action due to the subjectivity of our own vantage point. The film begins with an assassination, and climaxes with another. Each crime is followed by a boardroom scene (prologue and epilogue to the film proper) in which an investigating committee announces its completely inaccurate interpretation of the facts of the preceding assassination. At the end of the final boardroom scene, the last shot of the film, the members of the committee wink suddenly out of existence, leaving only the empty authority of their judicial chairs. Our sense of structural symmetry leaves us expecting that another assassination would follow, if the film’s action did not end at that point. The basic technique of conspiracy, then, is to disguise itself and erase all traces. Pakula’s film conjectures that when an alleged assassin dies before trial (e.g., Lee Harvey Oswald) any consideration of a conspiracy will be discarded by the investigators in favor of the easier circumstantial conclusion that the deceased “acted alone” and the case is closed. 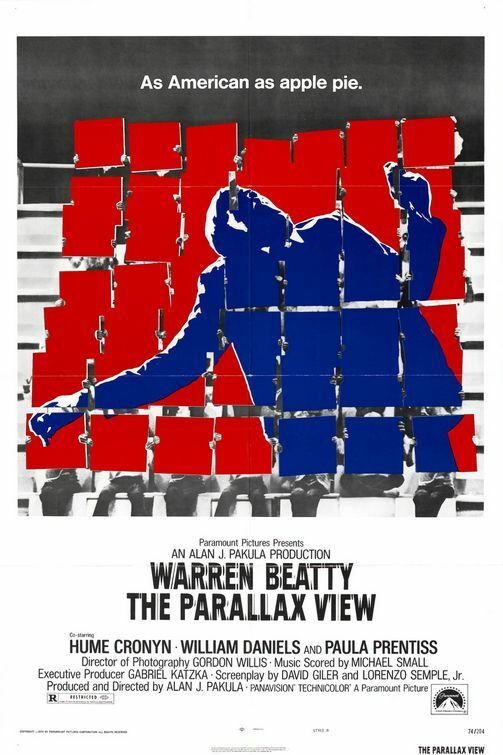 The Parallax View is not merely a “conspiracy film”; it goes beyond that. It presumes the possibility—even, perhaps, the likelihood—of conspiracy in assassinations, and seeks to discover how such conspirators might come by their assassins. The Parallax Corporation is not itself a conspiracy but an organization that searches out potential assassins, evaluates their psychological tendencies, trains them, and contracts them out to the real conspirators. How Parallax manages to advertise its services and attract clients is not suggested. In fact, with the exception of a few basic recruiting procedures, nothing about Parallax is learned in the film. We see and evaluate several of its actions and their results, but the corporation itself occupies no identifiable position, whether politically, morally, or even purely spatially. It is just another big business, one we never really see. Perhaps the most chilling aspect of The Parallax View emerges only upon retrospective reflection: we as viewers never see the Parallax Corporation as a threat to ourselves or even to our national security. We see it only as it defines itself: a large, faceless, anonymous corporation. This image, together with the big-business architecture, is Pakula’s metaphor for the threat of the dehumanizing corporate entity in American life, which may well destroy freedom—personal as well as political. The degree to which that process may already have set in is left to us to measure, and we are given the means to do it through glimpses of a written Parallax exam and the entirety of a visual response test, both immediate enough to have the viewer gauging his own reactions and wondering if he is potential assassin material. It is disturbing to note that the conspiracy-mongers, who are always the last to accept the possibility that a lone individual might have singlehandedly precipitated a catastrophe of national proportions, are also the first to insist that it takes a single crusading individual to uncover and expose a conspiracy. Pakula, in The Parallax View, is at least realistic enough to show the improbability of such an assumption, appropriately ending his film with a Polanskian depiction of the lone protagonist playing right into the hands of the evil he seeks to destroy. Nevertheless, the implication is clear: individuals must act for right, but wrongs are the result of conspiracy. This seems quite a narrow view, unsubstantiated by any historical occurrence I know of, but it is a view shared by many recent “conspiracy films,” including such dissimilar productions as Z, the made-for-TV Brotherhood of the Bell, and Serpico. Where makers of such films have generally erred is in presuming that their deceptively objective camera eye can somehow expand and improve our perception and interpretation of the larger events around us. But it just isn’t so, because—alas—we are all limited by the parallax view, and Pakula no less than the rest. Direction: Alan J. Pakula. Screenplay: David Giler and Lorenzo Semple Jr. Cinematography: Gordon Willis. Art Direction: Gordon Jenkins. Music Score: Michael Small. Production: Pakula. The Players: Warren Beatty, Hume Cronyn, Walter McGinn, Bill McKinney, William Daniels, Paula Prentiss, Anthony Zerbe, Kenneth Mars, Jim Davis.